Easter here. Hope you’ve used this opportunity to visit some family or friends or at least to have some time off. We visited my grandma (the one I told you about already) as we had a family reunion. Not to mention that my grandma’s doing great and is celebrating her 90th Birthday in 3 weeks, she’s had an accident with her water heating system just the day before we arrived, which caused her corridor to be covered in mud and she’ll be without hot water until somebody delivers and installs her a new one. So she made me wash the salad in the ice cold water and as strict as she is, I had to do it at least five times until the water was crystal clear. I don’t consider myself spoiled, but I really felt like that as I started whining and imagined how she will manage to cope with this for days, if I had trouble to cope for only 10 minutes. Being a family (everybody being interested in everybody) my cousin asked about what am I up to and how I am doing. Everybody knows I’ve opened an institute and that I’m traveling a lot, but no details, so there was much to tell. But I was not prepared for this, so I didn’t know where to start. I just said I’m in the process of going and it’s a beginning only. I was unable to take my “five minutes of fame”. I’m interested how you respond to criticism and how you respond to admiration. Can you handle both? Do you accept praise easily and are you capable to say thank you? And does that make you proud or confused? How come we are sometimes better “trained” to respond to negative than to positive feedback? Is there a way to unlearn old patterns and invite new ones? 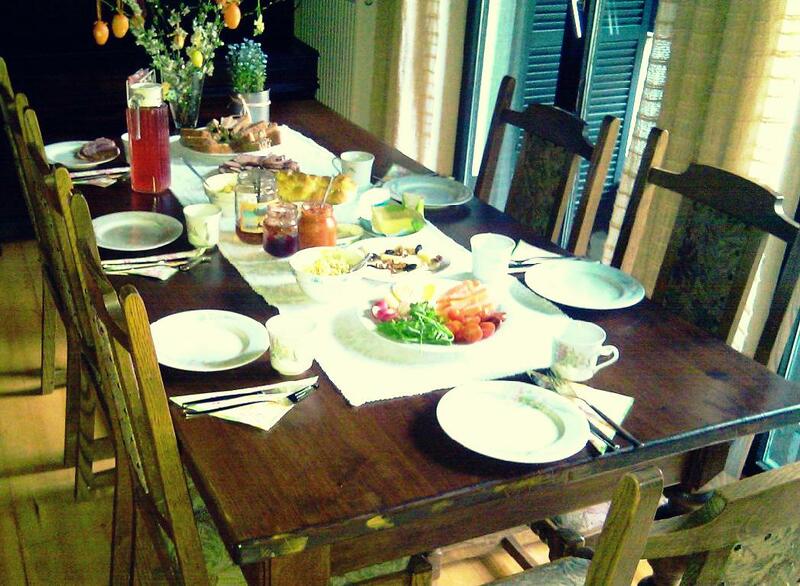 Easter breakfast. Helps you think.